Happy first day of spring!! Y'all it could not have gotten here fast enough!!! Today we are linking up with Momfessionals for Friday Favorites, and sharing a few fun guilty pleasures. It is no secret that I enjoy a reality television show or two. I love plopping down on the couch at the end of the day and just watch mindless television. Sometimes mama just needs to shut her brain down. The Real Housewives series is always a night time favorite, and I don't even need to record it as Bravo tends to run them often. I usually cozy up on the couch, click to the correct channel and settle myself in for a nice drama filled hour brain dump. Recently, however, I stumbled upon this little gem called Southern Charm. The season premier was this week and it did not disappoint. It is filmed in one of my favorite southern cities (Charleston, SC), and is an hour filled southern sass, drama, Lilly Pulitzer galore and beautiful antebellum homes. What more could you ask for? And if that wasn't fabulous enough to make you watch, meet Patricia, the mother of cast member Whitney. I'm hooked and I already am looking forward to next week's episode. I have a major way over the top slight obsession with nautical theme wear. I wasn't raised in a coastal town, but you would never know that if you saw me on a day to day basis. When I choose to put on non-yoga inspired clothes I usually have something nautical on. Lilly, seersucker, boats, anchors, anchors, and more anchors. I am almost to the point that my family and friends might stage and intervention. I've usually manage to ward them off by buying them a cute nautical themed gift. Sharing in the crazy is caring right? I should feel guilty about that part, but I don't. That part is most pleasurable. The guilty part comes in when I purchase something that I/we really don't need, but I just can't leave an anchor behind. Pillows seem to be the biggest culprit. Rumor has it that Target has a whole new line of anchor themed home goods rolling out in their stores as I type. As if Target wasn't dangerous enough! And it's pink. PINK!! I was at J. Crew recently making a return and it was anchored out! It took everything I had in me to resist purchasing the whole store, but I did manage to bring home a goodie or two (possibly six.) Here were my favorites. The fun didn't stop there. A little trip to Nordstrom also proved to me that fashion gods just want me to have a nautically themed wardrobe. Why else would they insist these lovely items greet me a top the escalator? It's just meant to be. And how fun are these diapers from The Honest Company?!? Adorable!! I've got it pretty bad if even our diapers are anchor themed. Oh my, have I been on a girl scout binge eating kick. Thank goodness I have been blessed with a fast metabolism because I can't tell you how many of these cookies I have eaten over the last month. Just trust that it's a lot. If I was calorie counting my FitBit would have blown up on me weeks ago. Every night I wait until the kids go to bed and then I make my way over to the pantry to retrieve the boxes from my secret hiding spot, and enjoy in quiet bliss. That's right, I don't even share them. I hide them deep in the pantry in a bag hidden behind the canned vegetables. Where I can assure you no one in this house will venture for a snack on their own. I should feel a little bit guilty that I am withholding the deliciousness that is a Girl Scout cookie from my own flesh and blood, but I don't. Not. One. Bit. Well there you have it. Some of my guilty pleasures. What are some of yours? P.S. - A quick note about two fun giveaways our friends over at Savvy Sassy Moms are hosting right now. Their March Baby Bundle Giveaway and their Spring Essentials Giveaway contain some of our favorite products and would be excellent prizes to win. Hop over for details and to enter. Good luck! OH man!! 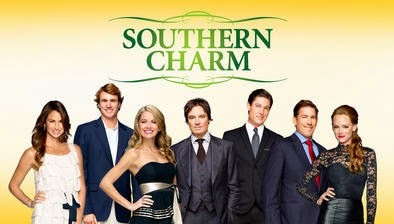 Southern Charm was SOOOOOOOO good. I only watched it a few times last year but after last night I am hooked. Although most of my guilty pleasures do involve reality TV! ;) And don't get me started on girl scout cookies. It's dangerous, I can polish off a box in one setting! Same here! If I don't stop myself I could totally eat a box of samoas in one sitting. The show cracks me up. Cameron makes me laugh out loud and I died when Patricia traveled to an event bringing with her her own Martini makings including crystal stemware and her butler to make it. Oh, I would love to watch that show! Did I miss what day and channel it comes on? Hi Laura! Oops that would have been good info to leave. It looks like new episodes air on Tuesday nights at 10pm on Bravo, and then repeat at various times through out the week. I LOVE watching Southern Charm!!!! I think Cameron is my favorite because she seems the most normal ha! I watched last season and can't wait to see what happens this season with Thomas and Catherine. Love Southern Charm. Watched it last season too! I vote that Patrica gets her own show. ~Lauryn G.